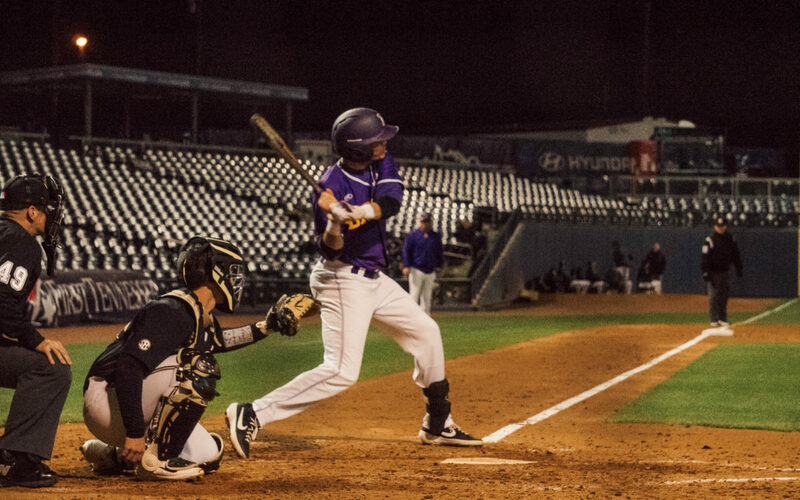 The Lipscomb baseball team beat the Middle Tennessee Blue Raiders 12-10 Tuesday night in a nail-biting game at Dugan Field. Middle Tennessee (15-22, 9-6 C-USA) started the game with two runs in the top of the first, but the Bisons (19-17, 3-6 ASUN) quickly took the lead in the bottom of the second. David Graves tripled to right center, sending Josh Martinez to score. Brian Moore hit a home run afterward, sending Graves home and giving Lipscomb the edge to start third inning, 3-2. Lipscomb’s lead didn’t last long, as Middle Tennessee scored five runs in the top of the third. However, the Bisons lessened the gap to 7-5 as Graves hit a double in the bottom of the third inning, sending Cade Sorrells home, later followed by Chris Bashlor. The fourth and fifth innings were scoreless for the Bisons with Middle Tennessee scoring two runs in the top of the fourth, but the Bisons recovered and scored four runs at the bottom of the sixth, tying up the game 9-9. In the bottom of the seventh the Bisons took the lead 11-9 after three scoreless innings for Middle Tennessee. While the Blue Raiders tried to make a comeback at the top of the eighth with one run, they struck out, leaving Lipscomb the chance to score once more before the ninth inning. Despite the Blue Raiders’ strong lead in the third inning, Lipscomb was able to gain some momentum that led to the win. The sixth inning proved to be a crucial turning point for the Bisons and evened the score after Middle Tennessee’s five-run streak. The Bisons fought till the end of the high-scoring game and took the win for the midweek matchup after three straight wins this past weekend. “We need to take the momentum of the weekend — we won three games on the weekend — and then the momentum from us coming back tonight, and take that to Newark and see if we can build on in a conference play against a really tough team,” Forehand said. The Bisons play again Thursday in Newark against NJIT and will be back to Dugan Field Tuesday the 23rd to face Belmont in the Battle of the Boulevard at 6 p.m. CT.